The story of the arrest and detention Ameer Makhoul is an eerie glimpse into the willingness of Israel’s security establishment to go to incredible and undemocratic lengths as it attempts to fight perceived internal “enemies.” Makhoul, an Israeli citizen, was finally permitted to meet with his lawyers after 11 days, but only after his defense team threatened to boycott his detention extension hearing. This week marks the 50th anniversary of the tale of the arrest of Zion Grisha Ameerovitch-Makhoulsky, who was taken in the middle of the night by the KGB. The story made waves through the international media, yet in Soviet Russia it was prohibited to mention the event in national media outlets. As in all dark dictatorships, the intellectuals who wanted to know where they lived, developed a network for sharing alternative information: Mouth to Ear, a network that functions at the speed of one’s voice and passes through the thick walls and fences that surround the basement interrogation centers of the KGB. And thus, thanks to the Mouth to Ear network, every person with some critical opinion regarding the Soviet Empire knows exactly and how and why something happened to Grisha Ameerovitch-Makholsky. At 3:00am 16 brutes from a special unit of the KGB surrounded Grisha’s house, which is located in a suburb in the distant northern port city of Danyaprokhifovsik. Five thugs from the special unit broke into the apartment, separated Grisha from his wife and daughters – Dina and Yehudit, refused to identify themselves when asked, and proceeded to search the entire apartment without demonstrating a search warrant. They took the personal journals of Grisha and his daughters, as well as the girls’ math workbooks. When they wanted to take Grisha as well, Mrs. Ameerovitch-Makhoulsky stubbornly demanded that the brutes present an arrest warrant. So they extracted an arrest warrant dated two weeks prior to that night. In retrospect, the Nobel Prize winner Professor Eliushkin-Sacharov, one of the directors of Man-is-Man, raised these points for consideration: if the security threat was urgent such that the Soviet security forces could wait almost two weeks from the day the warrant was signed until it was implemented, why did the search and arrest have to take place at 3:00am, violently, and in front of the children? Furthermore, Professor Sacharov asked why the detainee was not permitted to consult with his lawyer, as his wife claims. But this was not the end of the story. It turns out that despite the zealous Soviet censorship and the fearful long and strong hand of the KGB, the Mouth to Ear network managed to broadcast news of the grave violation of human rights that occurred. 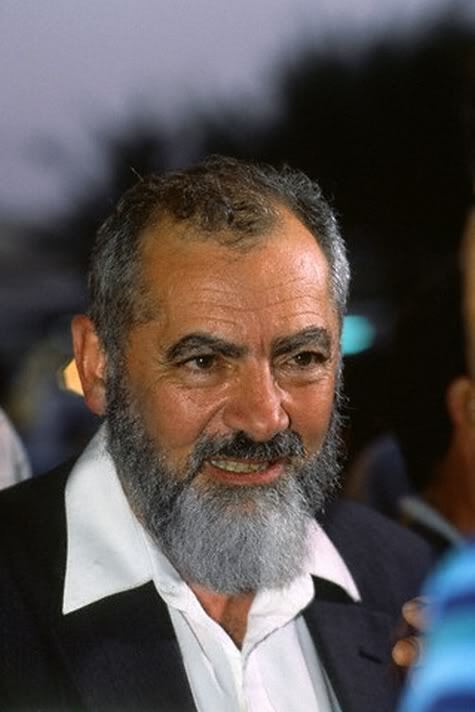 However, though in Soviet Russia it was prohibited to inform citizens of misdeeds committed by the secret security services, it was permissible to vilify Israel without restraint – the Mouth to Ear network broadcasted the story as if it took place in Israel instead of in Soviet Russia. And not to a Jewish detainee named Zion but rather with an Arab detainee. 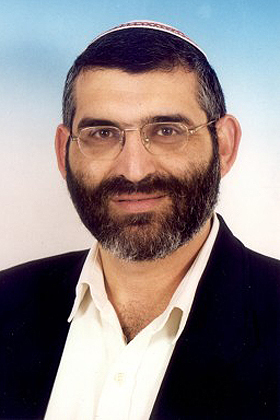 Even the name of the city Danyaprokhifovsik was replaced by the name of a northern Israeli port city, and the name of Grisha Ameerovitch-Makhoulsky was changed to an Arab name. 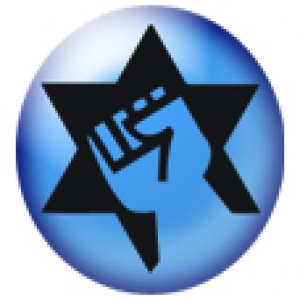 Further, the name of the organization of Zionist NGOs that Ameerovitch-Makhoulsky led was altered in the rumors to the name of an organization of Arab NGOs. In this way, the story of the arrest of Ameerovitch-Makhoulsky was broadcasted to all corners of Soviet Russia. It is difficult to believe that only 50 years have passed since the dark days in which the story of Ameerovitch-Makhoulsky took place, which seems – today – as if it took place before the days of Noah’s Great Flood. How wonderful that such a dark and shameful event could never take place in a democratic and free country like the Jewish and democratic State of Israel. 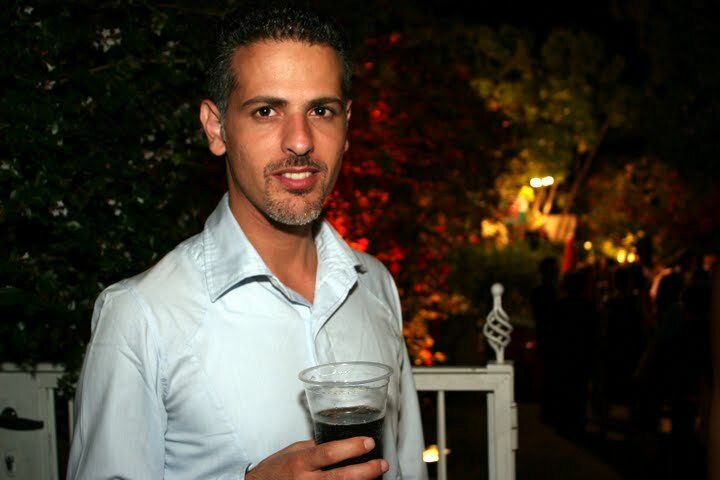 Shachar-Mario Mordechai is a poet living in Tel Aviv. He is the 2010 recipient of Tel Aviv Municipality’s nationwide “Poetry By the Way” competition. His poems, translations and reviews have been published by various magazines, literary supplements and online site. His book of poems, “History of the Future,” will be published later this year by Even Hoshen Publishing House. A second book will be published by Am Oved as part of his prize for the Poetry By the Way competition. On Iyar 28, 5727 (June 7, 1967), the third day of the Six-Day War, IDF troops entered the Old City of Jerusalem. 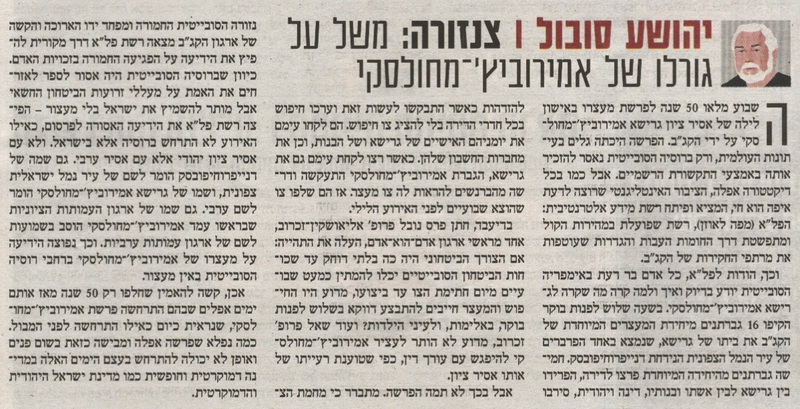 Within less than a year the Knesset established Iyar 28th as Jerusalem Day. After some three decades, while Binyamin Netanyahu was serving his first term as the prime minister of Israel, the Knesset conferred legal standing on that day: It established that this day would commemorate the connection between the city and the Jewish people and that, as such, it was incumbent upon us to celebrate it as a national holiday. I am a Jew, and I do not forget Jerusalem (nor do I forget my right hand, and certainly not my left), and I recognize the undeniable connection between my people and the holy city. However, it is beyond me why I am obliged to celebrate (or lament) Jerusalem specifically in the context of 1967. I won’t, as Elie Wiesel put it, say that Jerusalem is above politics, since everything that is connected to Jerusalem — and perhaps to every issue in our world — is political. And it is not inconceivable that any day chosen to celebrate Jerusalem Day should be imbued with political significance (even our distant neighbours to the east, the Iranians, celebrate Jerusalem Day — though it is a shame that they do not do so in the tradition of Cyrus). But in my opinion it is more than a tad unfair to mark Jerusalem Day — by law — in keeping with the whims of former MK Hanan Porat and the signature of Binyamin Netanyahu. Where does that legislation put me? I, like many others in Israel today, believe that 1967 sowed the destructive seeds that have the potential capacity to derail Israel’s future as a Jewish and democratic state. I believe that the occupation of another people undermines Israel’s security, its standing among the nations, its character as a just society, the Zionist vision of a national home for the Jewish people in the Land of Israel (and not the entire Land of Israel), and that it also undermines our hold on Jerusalem. That is why I am hard put to celebrate Jerusalem Day on Iyar 28th. Why am I denied the right to celebrate wholeheartedly my connection — as a Jew and an Israeli — to the city? Why Iyar 28th? Why shouldn’t Jerusalem Day be established immediately after the mourning period leading up to Tisha B’Av, so as to commemorate the emergence from mourning over the city’s destruction to celebration over its rebuilding? And when I say rebuilding I am not referring to Sheikh Jarrah. Just as we make the impossible transition from Memorial Day to Independence Day, why shouldn’t we celebrate Jerusalem Day immediately after Tisha B’Av? I know that Binyamin Netanyahu won’t pick up the gauntlet. But you there, you MKs who are worried about the fate of Jerusalem and the fate of Israel, can anyone hear me? !